Sometimes I question why we paint what we do. I have often thought that if I truly wanted to be happy as an artist, I would be a color field painter, because that is what it is really about for me – color. Those that know me well artistically know that drawing isn’t my favorite of things. I don’t get the same satisfaction from drawing that I do from painting. While I recognize the importance of drawing, as it is the most fundamental aspect of art, it has always been more of an arduous process for me. Painting, especially large fields of color, is a more joyful experience. So why am I not a color field painter? I love color field paintings, and Rothko has been a major influence in my work. But I think that to be a painter is to create problems for yourself that need to be resolved. Before a painting is begun, the canvas is white and perfect. Along with the first brush stroke comes the first problems to be worked out – is the color right? the shapes? the composition? The silhouettes in this painting were the most difficult problems for me to solve, as it was largely drawing. When I was very young, I taught myself different styles of calligraphy, and that was what I was thinking of when I was painting the trees and vegetation. While I am fluent in Western styles of calligraphy, I was also considering Chinese calligraphy, of which I am not well versed but I appreciate. I am hoping that the similar elegant qualities of line show through with this work. 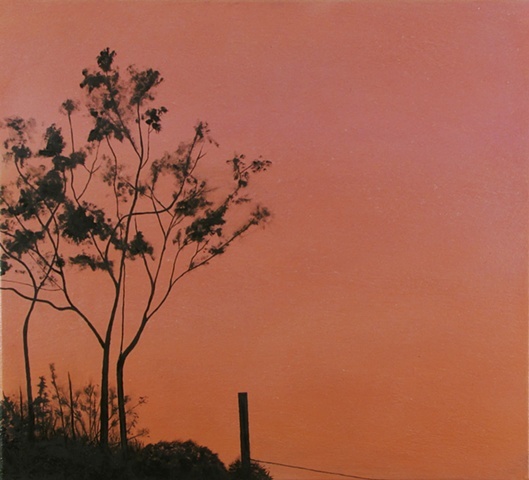 The inspiration for this painting was a sunset I saw from Mulholland Drive, and this work continues my exploration of the natural beauty in the Los Angeles area. This painting is also reminiscent of works I completed in Costa Rica in 2009, which is when I began to explore silhouettes of vegetation, as a way to make sense of the layers of shapes in the rain forest. While Los Angeles and Costa Rica couldn’t be more different, there is a similar quality of light, and beautiful sunsets abound in both places.